Discover all the beauties and great places that Argentina has to offer. Not only the places destinated to international tourism in Argentina, but also those places that the international tourist does not know and offers another alternative to visit. Cataratas del Iguazu (Iguazu Falls) were voted last week as one of the new 7 wonders of the world. The information was provided by the authorities of New 7 Wonder (N7W) and confirmed by the governor of Misiones, Maurice Closs. 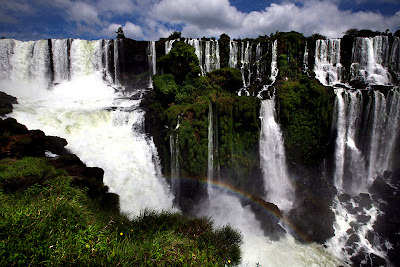 The organization of the "Seven Natural Wonders" visited each of the 28 finalists and decided that the Iguazu Falls are one of the new seven natural wonders. Iguazu Falls, with its 275 jumps on average according to the flow of the river, and considered "the largest curtain of water in the world", was nominated by Argentina and Brazil. The border between the two countries goes through the Garganta del Diablo, the greatest of its falls and the cannyon of the Iguazu. At its margins are the communes of Puerto Iguazú, Misiones, and Foz do Iguaçu in the Brazilian state of Paraná. Wow... Totally this place is amazing.. I'm glad that Iguazu Falls was chosen to be one of the New 7 wonders of the world. Argentina is known for its beautiful and natural places and spots. People in this country must be a nature lover who are willing to maintain the beauty of their environment. I love comments but delete spam. HINT: use the "Name/URL" function to get a free backlink straight to your blog! 2015 - Unique Argentina. Powered by Blogger.